A mirror can be a very good interior decoration. It lets visually increase the area of the room. Thanks to its reflectivity, the mirror makes the room brighter. In addition to the usual colorless looking glass, there is a number of mirrors with an original coating. 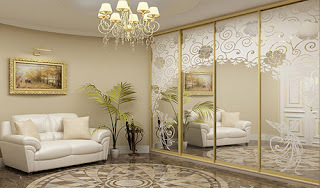 The mirror surface can be not only glossy but also ground. A frosted mirror does not provide such a reflection as a classic mirror. Therefore, these mirrors are often used for aesthetic purposes. Unlike frosted glass, the matt mirror is completely opaque and reflects the scattered rays of light. This mirror is perfect for the manufacture of furniture and protective coatings, or it can even be used to finish the wall. The color matt mirror looks especially beautiful. You can successfully combine frosted mirrors of different colors in one interior. The matting process allows forming various matte patterns, which means the opportunity to create a classic, but very beautiful design of furniture or interior. The frosted patterns can be plain white or colored. Colored tracery will look especially impressive. Patterns can be small or large and expressive. A wall mirror framed in a matt pattern can be a great example of this technique. 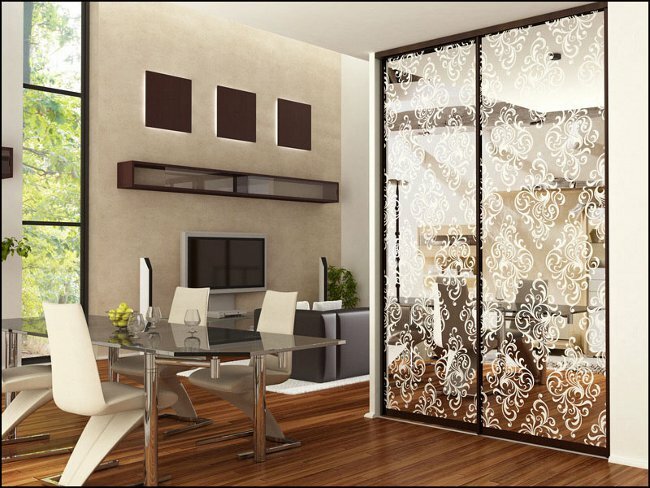 Frosted mirrors and the mirrors with matt patterns are widely used in the manufacture of cabinets, interior doors, and partitions.